Integrated Gasification Combined Cycle (IGCC) Technologies discusses this innovative power generation technology that combines modern coal gasification technology with both gas turbine and steam turbine power generation, an important emerging technology which has the potential to significantly improve the efficiencies and emissions of coal power plants. The advantages of this technology over conventional pulverized coal power plants include fuel flexibility, greater efficiencies, and very low pollutant emissions. The book reviews the current status and future developments of key technologies involved in IGCC plants and how they can be integrated to maximize efficiency and reduce the cost of electricity generation in a carbon-constrained world. The first part of this book introduces the principles of IGCC systems and the fuel types for use in IGCC systems. The second part covers syngas production within IGCC systems. 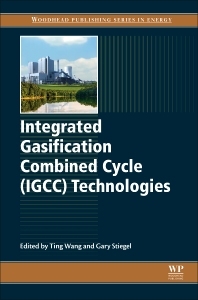 The third part looks at syngas cleaning, the separation of CO2 and hydrogen enrichment, with final sections describing the gas turbine combined cycle and presenting several case studies of existing IGCC plants. Dr Ting Wang is the Jack and Reba Matthey Endowed Chair of Energy Research, Professor in the Department of Mechanical Engineering at The University of New Orleans, and Director of the Energy and Conversion and Conservation Center, USA. Dr Gary Stiegel is Director of the Major Project Division at the National Energy Technology Laboratory, U.S. Department of Energy, USA. He is responsible for the Department of Energy’s commercial demonstration projects within the Clean Coal Power Initiative and Industrial Carbon Capture and Storage programs.